Recent studies of anadromous salmon (Oncorhynchus spp.) on the Pacific Coast of North America indicate an important and previously unrecognized role of salmonid nutrients to terrestrial biota. However, the extent of this uptake by primary producers and consumers and the influences on community structure remain poorly described. We examine here the contribution of salmon nutrients to multiple taxa of riparian vegetation (Blechnum spicant, Menziesii ferruginea, Oplopanax horridus, Rubus spectabilis, Vaccinium alaskaense, V. parvifolium, Tsuga heterophylla) and measure foliar δ15N, total %N and plant community structure at two geographically separated watersheds in coastal British Columbia. To reduce potentially confounding effects of precipitation, substrate and other abiotic variables, we made comparisons across a sharp ecological boundary of salmon density that resulted from a waterfall barrier to salmon migration. δ15N and %N in foliage, and %cover of soil nitrogen indicators differed across the waterfall barrier to salmon at each watershed. δ15N values were enriched by 1.4‰ to 9.0‰ below the falls depending on species and watershed, providing a relative contribution of marine-derived nitrogen (MDN) to vegetation of 10% to 60%. %N in foliar tissues was slightly higher below the falls, with the majority of variance occurring between vegetation species. Community structure also differed with higher incidence of nitrogen-rich soil indicator species below the waterfalls. Measures of δ15N, %N and vegetation cover indicate a consistent difference in the riparian community across a sharp ecological boundary of salmon density. The additional N source that salmon provide to nitrogen-limited habitats appears to have significant impacts on the N budget of riparian vegetation, which may increase primary productivity, and result in community shifts between sites with and without salmon access. This, in turn, may have cascading ecosystem effects in forests adjacent to salmon streams. The cycling of nutrients between Pacific salmon (Oncorhynchus spp.) and coastal watersheds has gained much attention in the past decade [1, 2]. As well as an important contribution to estuarine and stream productivity , salmon nutrients are transferred from streams into adjacent forests by bears and wolves where remnants of the partially-consumed carcasses are used by a diverse assemblage of vertebrate and invertebrate scavengers [4–7]. Coastal forests of western North America tend to be nitrogen-limited and there is recent evidence that vegetation in the narrow riparian zone adjacent to the streams also sequesters these marine-derived nutrients [8–12]. The contribution of salmon tissues to total nitrogen concentration in these riparian plants is variable but values from 10% to 40% have been reported [9, 11, 12]. Nitrogen deficiencies are known to limit plant growth [13–15] while additions of nitrogen, such as that from salmon carcasses, could potentially increase primary and secondary productivity. For example, Sitka spruce (Picea sitchensis) has higher growth rate adjacent to salmon streams relative to sites without salmon . Increased nitrogen can also lead to changes in plant species composition, diversity and dominance [16–20], in part by shifting biomass allocation from roots to shoots and leaves [14, 21]. Additionally, recent evidence suggests that these shifts in salmon-nutrient levels may have cascading effects in higher trophic levels and ecosystem structure . Multiple parameters remain poorly characterized in these expanding studies linking the role of salmon to productivity and diversity in terrestrial ecosystems. Interpretations of the nitrogen and carbon isotope ratios, which provide the major proxy for quantifying contribution of salmon-derived nutrients to other taxa, are based on the assumption that the amount of isotopic enrichment is directly proportional to the relative contribution of salmon [8, 22]. However, isotopic enrichment in vegetation can also be influenced by slope, precipitation, substrate and other factors [23–26], which confound estimates of the direct contribution of salmon. Recently, we examined isotopic signatures in riparian vegetation from salmon watersheds of Vancouver Island, British Columbia, and observed substantial site variability in 15N signatures in watersheds without salmon . In order to reduce confounding effects on isotopic signature, we investigate in this paper the contribution of salmon-derived nitrogen to multiple plant species collected immediately above and below waterfalls that are barriers to salmon migration in two geographically separated watersheds on the central coast of British Columbia, Canada. We use foliar δ15N values to determine the extent of N cycling from salmon into terrestrial vegetation. We determine %N values in foliar tissue. This may be a proxy for primary productivity given that total nitrogen in plant tissue is often a direct measure of metabolic activity and photosynthetic rate [27, 28]. We also assess plant community structure by examining relative abundance of taxa previously identified as indicators of soil nitrogen status . This project is part of an ongoing assessment of salmon-bear interactions and nutrient cycling in riparian taxa [6, 11, 30]. At each watershed, all species showed an increase in foliar δ15N values across the waterfall barrier (Figure 1). At Clatse River, foliar 15N among species was enriched from 1.4‰ to 5.6‰ below the falls relative to those above the falls while at Neekas River, enrichment ranged from 7‰ to 9‰ across the barrier. 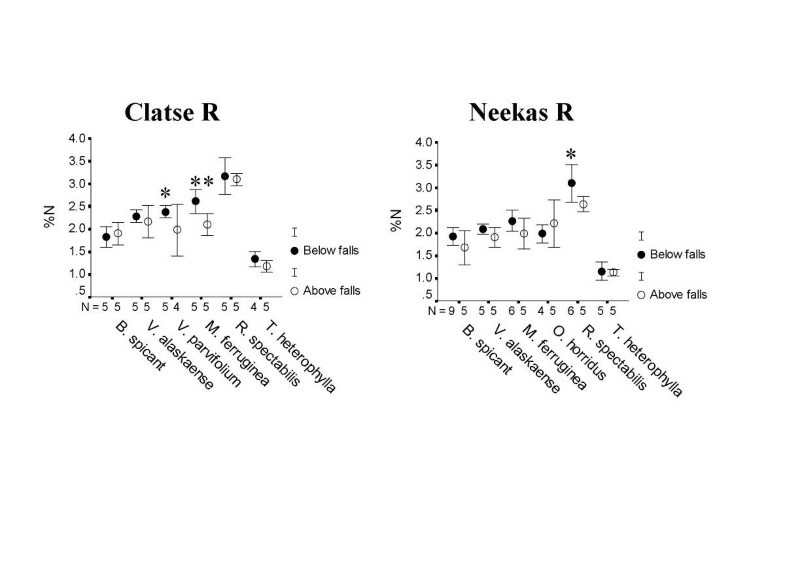 Analyses of barrier and vegetation demonstrated that both are highly significant sources of variation in each watershed (barrier: Clatse, F1 = 70.14; Neekas, F1 = 409.63, p < 0.001 for both, two-way ANOVA; vegetation species Clatse, F5 = 6.31; Neekas F5 = 7.05, p < 0.001, for both). 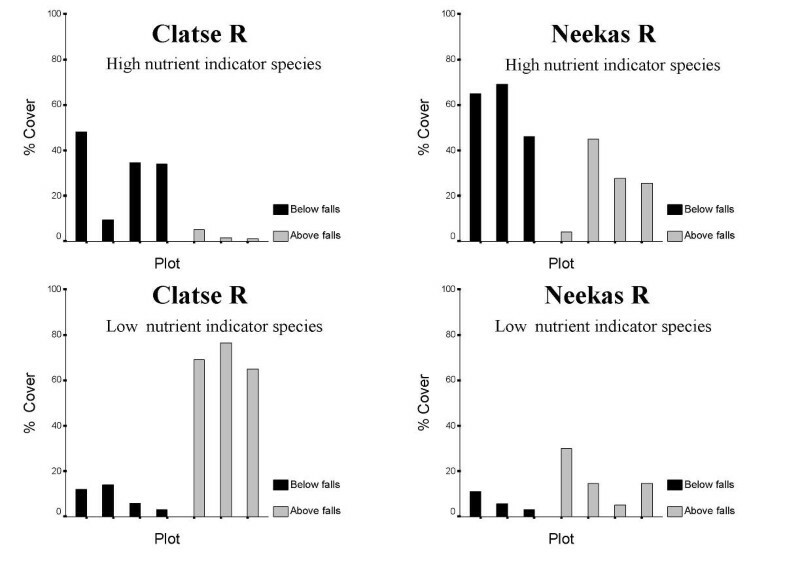 A greater proportion of the variance in 15N was attributed to barrier (R2: Clatse= 0.58, Neekas= 0.88) than to vegetation species (R2: Clatse= 0.38, Neekas= 0.38). δ15N values in riparian vegetation collected immediately below and above waterfall barriers to salmon at Clatse and Neekas rivers, B.C. T-test results: * denotes p < 0.05; ** denotes p < 0.01. Total contribution of marine-derived nitrogen (MDN) in these riparian habitats varied among watershed and among species (Figure 2). MDN was higher at Neekas River (range 45–65%) than at Clatse River (range 12–48%) (t10 = 4.13, p = 0.002). At Clatse, lowest values occurred in T. heterophylla and highest values in R. spectabilis while at Neekas River, T. heterophylla had the lowest while V. alaskaense had the highest values. 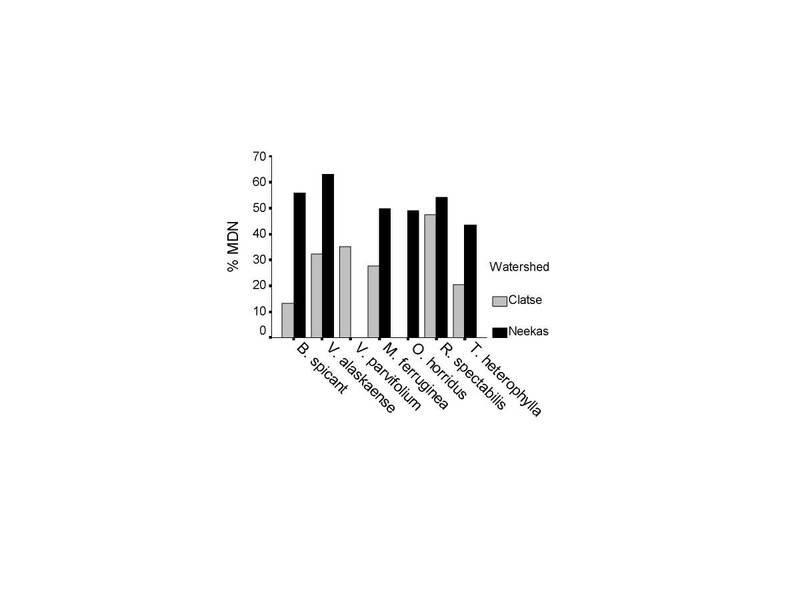 %MDN in riparian vegetation collected below waterfalls at Clatse and Neekas rivers, B.C. Overall, %MDN values at Neekas are higher than at Clatse (t-test p < 0.001). Total tissue nitrogen was examined as a potential proxy for primary productivity. There were no overall differences between watersheds (Clatse = 2.16%, Neekas = 2.00%, t22 = 0.70, p = 0.49). At each river, there were significant differences above and below waterfalls (Clatse: F1 = 13.04, p = 0.001; Neekas: F1 = 6.63, p = 0.013) with a marginal tendency towards higher mean values of %N in foliage collected below the falls (Figure 3). However, among individual species, these comparisons were significant (p < 0.05) only for M. ferruginea at Clatse River and for R. spectabilis at Neekas River. Within each habitat, there were also consistent differences in %N among species (Clatse above barrier: F5 = 38.14, p < 0.001; Clatse below barrier: F5 = 48.22, p < 0.001; Neekas above barrier: F5 = 19.50, p < 0.001; Neekas below barrier: F5 = 37.18, p < 0.001). In both watersheds, above and below the falls, T. heterophylla, and to a lesser extent B. spicant exhibited the lowest tissue nitrogen while R. spectabilis had the highest levels. Total %N values in riparian vegetation collected immediately below and above waterfall barriers to salmon at Clatse and Neekas rivers, B.C. R. spectabilis and O. horridus represent nitrogen-rich soil indicator species, T. heterophylla is unclassified, and all others are indicators of nitrogen-poor soil. T-test results: * denotes p < 0.05; ** denotes p < 0.01. We examined the relative cover of vegetation corresponding to the indicator groups (Table 1). Nitrogen-rich soil indicator species had a higher cover below than above the falls in all plots on both watersheds (Clatse: above barrier: 2.5%, below barrier: 31.5%, p = 0.06, Mann-Whitney; Neekas: above barrier: 25.5%, below barrier: 60%, p = 0.06, MW; Figure 4). Nitrogen-poor soil indicator species demonstrated the reverse trend with marginally higher percent cover above than below the falls (Clatse: above barrier: 70.2%, below barrier: 8.75%, p = 0.06, MW; Neekas: above barrier: 16%, below barrier: 6.5%, p = 0.23, MW). Total understory vegetation cover by soil nitrogen indicator category in 10 m × 10 m plots on the Clatse and Neekas rivers, B.C. Species are separated into nitrogen-rich soil and nitrogen-poor soil indicator categories based on data by Klinka et al. .
Understory vegetation soil indicator species from research plots on the Clatse and Neekas rivers, B.C. Species are separated into nitrogen-rich soil and nitrogen-poor soil indicator categories based on data by Klinka et al. .
δ15N values in terrestrial plants from forest ecosystems are influenced by isotope values of the principal nitrogen sources as well as isotopic fractionation . Predominant sources of nitrogen to typical forest ecosystems include atmospheric deposition and biological N2 fixation. However, there is increasing evidence that salmon constitute an important nutrient source to riparian forests in the Pacific Northwest as a consequence of bear-mediated salmon carcass transfer [4, 30], bear urine and feces deposition , flooding events , and transfer through the hyporheic zone . We observed major δ15N enrichment in all species of vegetation across waterfalls that are a barrier to salmon migration on two geographically separated watersheds on the mid-coast of British Columbia. These differences, over a sharp ecological gradient in nutrient source, provide strong evidence for the direct role of salmon-derived nutrients in riparian community nitrogen budgets. Within-watershed comparisons of conspecifics collected immediately above and below the waterfalls minimize differences such as site history, substrate, proximity to the stream and ocean, and microclimate, all of which may influence 15N signatures among species across watersheds or over larger distances [23, 26]. As such, differences in foliar 15N above and below falls can be largely attributed to the presence/absence of salmon. Although the majority of the variance in δ15N in our study occurs as a consequence of the natural barrier to salmon, we find that plant species is also an important source of variation in foliar 15N values. There is isotopic inconsistency among plants with different growth forms, rooting depths, nitrogen sources as well as mycorrhizal and symbiotic bacterial associations [25, 33–38]. Our results demonstrate that the lowest 15N occurred in mature T. heterophylla. This is consistent with Virginia & Delwiche  who found both mature coniferous and deciduous trees to have the lowest foliar 15N of all growth forms investigated, possibly due to differential access to depleted organic N relative to inorganic N sources . Sharp natural boundaries such as barriers to salmon migration offer a useful opportunity to investigate modes of plant nitrogen nutrition. Our estimates of marine-derived nutrients from these watersheds indicate that salmon provide a substantial contribution of nitrogen to multiple species of riparian plants. More than half the samples from Clatse River, with 22,000 salmon/km, have in excess of 30% MDN, and all samples from Neekas River, with 24,000 salmon/km, have more than 40% MDN. These values are higher than those reported by Bilby et al. who estimated an average of 17.5% MDN in foliage of T. heterophylla, R. spectabilis and O. horridus occurring along a spawning stream in Washington with relatively low salmon abundance (<1000 coho/km). Values ranging from 12 to 32% MDN in foliar samples of P. sitchensis, O. horridus and two species of ferns (Dryopteris dilatata and Athyrium filix-femina) were reported from two sites in Alaska with 'dense spawning populations of pink salmon' . In comparison, Kline et al. found that in an Alaskan lake that supports more than 10 million sockeye salmon, up to 90% of the N in periphyton (benthic algae) was derived from salmon. These cumulative results further support the hypothesis that the percentage of MDN in aquatic and riparian primary producers is associated with the density of salmon in the system, a pattern which has been observed across multiple salmon-bearing watersheds on Vancouver Island  and on the central-coast of British Columbia . Although we observed higher %MDN values at Neekas River compared with Clatse River with similar salmon density, the salmon biomass at Neekas River was substantially higher due to the increased proportion of large-bodied species such as chum salmon. It is possible that our estimates of MDN, which reach 60% of total foliar nitrogen, are inflated. For example, fractionation from ammonia volatilization can result in 15N enrichment of the nitrogen source prior to uptake by primary producers . If this occurred with decaying salmon carcasses and waste products from predators and scavengers, it would result in elevated δ15N values in the soil and vegetation, which would lead to inflated MDN calculations, although we are unable to evaluate the extent of this possible effect. Other factors in our estimates relate to general MDN models that assume N fractionation in soils and uptake by plants do not differ between nutrient rich and nutrient poor habitats, yet it is possible increased soil and plant productivity can influence δ15N signatures  and this in turn will lead to inflated %MDN values. Several of our assumptions lead to conservative estimates of MDN. We used a MEM value of 13‰ based on chum salmon  despite a large proportion of pink salmon in the stream. Pink salmon, occurring at a lower trophic level, have a lower 15N signature than chum salmon, and use of this end member would have lead to higher estimates of %MDN. Furthermore, the model assumes that there was no transfer of salmon nutrients above the waterfalls yet we did observe occasional upstream movement of bears, which would have resulted in some deposition of urine and feces (i.e. 15N enrichment) above the barrier. As such, our vegetation δ15N values above the falls may be slightly enriched relative to vegetation further upstream or away from the spawning channel, and this would result in more conservative %MDN estimates. This may be particularly true on the Clatse where foliar δ15N values are on average 3‰ higher above the falls compared to the Neekas (see Figure 1). Therefore, we suspect that our estimates of %MDN provide a realistic measure of the contribution of salmon-derived nitrogen to terrestrial riparian plants in these watersheds. What are the consequences of these yearly pulses of salmon nutrients to primary productivity? Helfield and Naiman  found evidence for increased annual growth of Sitka spruce with access to salmon, as well as additional evidence for increased %N in shrubs . Our data also show modest increases in %N in foliar tissues of riparian species with access to salmon relative to above waterfalls sites. Such increased nitrogen levels may reflect higher metabolic activity in the plants including photosynthetic rate [27, 28]. The majority of the variance in foliar %N values that we observed occurred among plant species within the same habitats. Similar results have been observed elsewhere [10, 25, 37, 38, 43] and reflect differences in species competitive ability for soil nitrogen, taxon-specific N requirements, mechanisms of N uptake, N allocation within plants, and different soil N sources. Plants with higher foliar concentrations of a particular nutrient are often more competitive for that specific nutrient . In coniferous forests of the Pacific Northwest, nitrogen-rich soil indicator species tend to have higher foliar %N than nitrogen-poor soil indicators . This pattern is also shown in the current study, as was evident in the high %N values in R. spectabilis in both watersheds in contrast to the lower values in nitrogen-poor soil indicators. This suggests that nitrogen-rich soil indicator species may have a competitive advantage in these habitats. The very low levels of total N in T. heterophylla foliage may be indicative of N-limited growth and possibly a high degree of competition with understory vegetation. Based on ranking of foliar-nitrogen levels among conifers in British Columbia , our data indicate a moderate to severe N deficiency in T. heterophylla in both watersheds. Although we have not yet quantified the total annual input of salmon-derived nutrients to these two ecosystems, we observed extensive carcass transfer below the waterfalls at both watersheds. Reimchen  documented an average input of 120 kg/ha of N into a riparian zone on Haida Gwaii, largely from black bear mediated transfer of salmon carcasses. Individual bears captured up to 700 salmon over a 40 day salmon spawning period at Bag Harbour, most of which were carried into the riparian zone and only partially consumed . Geographical surveys in 110 watersheds throughout the coast of British Columbia indicate that the extent of riparian transfer is roughly proportional to the numbers of salmon entering the rivers and the number of bears in the watershed (Reimchen, unpublished data). Plants can act as indicators of specific soil conditions from shallow, nutrient-poor soils to deep, nutrient-rich soils, and may even prefer certain concentrations of a specific nutrient such as nitrogen, phosphorus, calcium or magnesium . Although the presence of nutrient-rich indicators in nutrient-poor sites and vice versa is a common occurrence, total cover of plants from different indicator categories within a defined area provide insight into specific site properties within different biogeoclimatic subzones . Nitrogen-rich soil indicator plants occur in soils that have six times the mineralizable nitrogen, double the total soil N, and double the available Ca, Mg, and K than soils dominated by nitrogen-poor soil indicators, and occur in areas with reduced forest floor pH and reduced C/N ratios . Our results demonstrate a clear trend towards increasing cover of nitrogen-rich soil indicator plant species below the falls adjacent to the salmon spawning channel compared to similar plots above the falls. In contrast, nitrogen-poor soil indicators were more prevalent above the falls. Consequently, there are important basic differences in edaphic conditions across this sharp ecological boundary that may reflect thousands of years of the regular seasonal influx of the marine-derived nutrients. There are potentially multiple factors structuring the distribution and abundance of plant species in these riparian habitats apart from relative abundance of salmon nutrients. Understory plant species distribution and cover, as well as humus and soil types, are dictated by environmental factors such as site history, parent material, slope position, moisture and light regimes, and nutrient sources [44, 45]. Red alder (Alnus rubra), which is a nitrogen fixer, is present in both Clatse River and Neekas River but at low densities. At Clatse River, alder comprised 8% of the canopy cover below the falls and was absent above the falls, and as such would contribute to elevated nitrogen availability below the falls. However, at our study plots below waterfalls at Neekas River, red alder did not occur, though it reached 12% canopy cover above the falls. In comparison, Helfield and Naiman  found alder to be more abundant in non-salmon riparian zones. The logging that occurred at Clatse River in the 1940's presumably had only minor impact on the abundance and distribution of nitrogen-rich soil species because the same trends in indicator species were observed at Neekas River, which has not had any logging activity. The recognition that marine-derived nutrients can be cycled back into terrestrial communities indicates a potential coupling in productivity between these ecosystems. Input of guano on seabird colonies that leads to increased primary and secondary productivity , sea wrack washing up on beaches that supplements diets of terrestrial scavengers , or freshwater invertebrates derived from salmon carcasses that subsidize stream and lacustrine habitats [3, 8, 48] demonstrate such linkages. These examples of cross-habitat interactions can initiate trophic cascades  that structure communities. If indeed salmon nutrient transfer to riparian forests increases primary productivity and alters community structure, such as percent cover of nitrogen-rich soil indicator species, then this has the potential for multiple cascading trophic effects. For example, some plants may rely less on mycorrhizal fungi for nutrient uptake and may derive an increased proportion of nutrients through direct soil root uptake . Nutrient-poor indicators such as the Ericaceae (Vaccinium spp., M. ferruginea, and Gaultheria shallon for example) depend highly on mycorrhizal associations for nutrient uptake and have high concentrations of anti-browsing compounds in their foliage relative to many nutrient rich plants. Populations of herbivorous insects would be predicted to respond to higher foliar N concentrations and decreased foliar defenses in nitrogen-rich soil indicator plants by increasing individual and population growth rates [50, 51]. Furthermore, nutrient inputs to coniferous forest soils have been shown to increase forest floor turnover rates, soil N capital and litter N concentrations, as well as alter the populations of soil fungi, bacteria and litter invertebrates [52–54]. Salmon-derived nitrogen has been documented in multiple trophic levels of terrestrial invertebrates on our study watersheds , and it is possible that salmon nutrient subsidies have many direct and indirect effects on invertebrate populations. In turn, these processes may affect populations of vertebrates, particularly songbirds, which have been shown to respond to experimental fertilization  and exhibit higher population sizes along salmon streams in Alaska . The historical decline in salmon abundance, reaching 40–90% in British Columbia, Washington, Oregon and California  may have substantially more ecosystem-level context to terrestrial habitats than currently recognized. 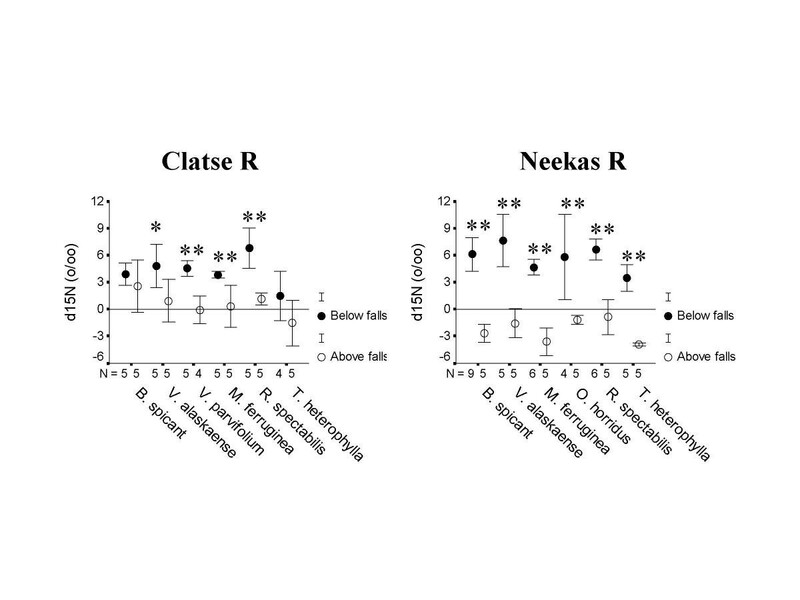 Assessments of δ15N and total %N in foliar samples, and plant community assemblage each demonstrate the influence of salmon in terrestrial environments. Within-watershed comparisons at two river systems in coastal British Columbia sampled immediately above and below a barrier to salmon migration minimizes sources of variation that may occur among watersheds. Results presented here demonstrate that salmon are directly linked to the nutrient budget of riparian plants. Differences in nitrogen uptake occur among species due to competition, soil properties and other factors. Greater abundance of nitrogen-rich soil indicator plants in habitats with access to salmon signifies community level shifts as a direct result of the influx of these additional nutrients. Coupled with earlier findings of increased primary productivity where salmon are present , these results illustrate the impact of this nutrient subsidy to riparian forests and the bi-directional flow of nutrients among marine, freshwater and terrestrial ecosystems. Our study sites comprise two old-growth western hemlock, salmon-bearing watersheds, the Clatse (52° 20.6'N; 127° 50.3'W) and Neekas rivers (52° 28.4'N; 128° 8.0'W), on the central coast of British Columbia, Canada (for detailed site description see ). Climate is cool and wet, with a mean annual temperature of 8°C and a mean annual precipitation of 3700 mm . The two watersheds are separated by 30 km and each occurs in the Coastal Western Hemlock Biogeoclimatic Zone near the boundary of the central very wet hyper-maritime (CWHvh2) and sub-montane very wet maritime (CWHvm1) subzones . Pink salmon (Oncorhynchus gorbuscha) and chum salmon (O. keta) are the predominant species of anadromous fish in these rivers. During the period 1990–1999, annual returns at Clatse River averaged 17,000 pink salmon and 5,000 chum salmon (22 salmon/m2), while at Neekas River, returns averaged 18,000 pink salmon and 30,000 chum salmon (23 salmon/m2) (Department of Fisheries and Oceans escapement data: 1990–1999). All spawning activity occurs from the estuary upstream to a 5 m high waterfall that excludes further upstream migration of the salmon at both watersheds. The falls occur 1 km upstream on the Clatse River and 2.1 km upstream on the Neekas River. Foliar samples were collected from seven species of riparian plants above and below the waterfalls at Clatse and Neekas watersheds in early September 1999. These comprise deerfern (Blechnum spicant), false azalea (Menziesii ferruginea), devil's club (Oplopanax horridus), salmonberry (Rubus spectabilis), Alaskan blueberry (Vaccinium alaskaense), red huckleberry (V. parvifolium) and western hemlock (Tsuga heterophylla). Collection sites were within 50 m of the top and 50 m of the bottom of waterfalls along the stream, and within 15 m of the stream edge perpendicular into the forest. At each site foliage from up to nine individual plants of each species were collected. where R is the ratio of 15N/14N stable isotopes. where Obs is the δ15N value of the sample from a site below the waterfalls, TEM is the δ15N value of the terrestrial end member (foliar sample of same species above falls), and MEM is the δ15N value of the marine end member (salmon tissue). We use 13.01‰ for MEM . In the late summer of 2000 and 2001, we inventoried riparian vegetation on the Clatse and Neekas rivers in small plots (10 m × 10 m) above and below the waterfalls at both Clatse (four plots below falls, three above falls) and Neekas (three plots below falls, four above falls) rivers. We matched as closely as possible the forest structure, canopy cover and slope in the sites above and below the falls and as such, plot locations ranged from 100 to 250 m above and below the waterfalls and were within 20 m of the stream. All plots had negligible slope. Within each plot, understory vascular plant species were identified and percent cover of each visually estimated. Canopy cover was similar above and below the falls on both watersheds (Clatse above falls: = 58.0+/-5.6%; Clatse below falls: = 66.5+/-3.5%; Neekas above falls: = 48.8+/-9.0%; Neekas below falls: = 49.0+/-11.4%). While the Neekas River has no history of commercial logging, Clatse River had some old-growth removal in the early 1940's, and currently a mixed old-growth-second growth western hemlock forest dominates the plots in this location . Soil profiles were dug in representative sites to determine the humus type and original parent material. Mor humus forms predominated on the Clatse and Neekas rivers above the falls with matted LFH (decomposing litter) horizons ranging from 10–25 cm thick. Below the falls, ligno, lepto and mull moder humus forms predominated with a thin LFH 3–10 cm thick and an Ah (mineral horizon enriched in organic matter) 5–20 cm thick . The parent material at all plots was dominated by coarse alluvial sand interspersed with a few large rock fragments. Morrainal silt deposits increased with increasing distance from the stream. Sources of variation in foliar 15N and total %N among and within watersheds, above and below the waterfalls and among plant species were compared (paired-t tests, two-way ANOVA, multiple range tests). Understory plant species were grouped into soil nitrogen indicator categories (poor, rich) based on Klinka et al. (Table 1). Unclassified and nitrogen-medium soil indicator species were not included in the analysis. On each watershed, we compared total cover for each indicator group above and below the waterfalls. As assumptions of normality and homoscedasticity were not met in all cases, we used Mann-Whitney non-parametric tests. We would like to thank Tracy Rennie, Samantha Robbins, Jonathan Moran, Gilbert Ethier, Barbara Hawkins, Dan Klinka, Bristol Foster, Chester Starr, Carsten Brinkmeier, Danny Windsor, Mike Windsor, Gerry Allen and Joe Antos for field assistance or discussion, Myles Stocki for stable isotope analysis, and Barbara Hawkins and Richard Ring for additional lab space. We would also like to thank the Blue Fjord Charters, Larry Jorgenson, the Raincoast Conservation Society and the Heiltsuk First-Nations for additional field support. This project was supported by funds from the David Suzuki Foundation, Friends of Ecological Reserves and a Natural Sciences Engineering Research Council operating grant (N2354) to TER. DDM carried out the foliar sampling and statistical analysis of total %N and N isotopic data. MDH carried out the design and analysis of the vegetation community data. TER conceived of the study and participated in its design and coordination. All authors contributed to writing the ms but DDM was primarily responsible for the first draft. All authors read and approved the final manuscript.